The Panthers are locked and loaded and have their sights set high for this upcoming season. Led by a highly talented young core, Florida is ready to capture the Atlantic division and bring home a Stanley Cup. They will look to edge out rivals the Tampa Bay Lightning and the Philadelphia Flyers for their shot at championship glory. Get your Florida Panthers tickets and head over to the BB&T Center to be a part of your team's championship hunt. Founded in 1993 and member of the Atlantic Division in the Eastern Conference of the NHL, the Florida Panthers represent the Miami metropolitan area. With one Conference Championship and two Division Championships under their belt, the Florida Panthers have had many memorable moments in their history. The Rat Trick – More of a gimmick than a memorable moment, this comedic folk lore came into existence on October 8, 1995. After killing a rat in the locker room before the Panthers’ home opener against Calgary, right wing Scott Mellanby scored two goals. When asked about Mellanby’s performance, goalie John Vanbiesbrouck joked saying Mellanby had a rat trick which involved him killing rats before the game and then scoring. Almost immediately Panthers fans started throwing plastic rats on the ice every time the Panthers scored a goal. The tradition went on for a season before it was outlawed by the NHL. Clock Strikes Midnight – The Florida Panthers Cinderella run came to an end on June 10, 1996. Having won the Conference Quarter Finals against the Boston Bruins, the Conference Semi Finals against the Philadelphia Flyers and the Conference Finals against the Pittsburgh Penguins, the Panthers faced the Colorado Avalanche in the Stanley Finals. The Panthers gave it their all in the series but the Avalanche proved to be too good for Florida. The Panthers lost the series 4-0 with the last game going into triple overtime before the Avalanche were able to get one past Vanbiesbrouck. The Breezer saved 55 attempts from the Avalanche that night. The greatest list for the Florida Panthers starts with Pavel Bure. This Russian born Right Wing spent only two seasons with the Panthers, in which he scored 60 goals each in back to back campaigns. Bure’s game had all the elements prominent in the Soviet Union. He had the speed, skill and the ability to possess the puck. During his two seasons with the Panthers and throughout his sixteen year career, he was called the Russian Rocket. John Vanbiesbrouck is another Panther who played a critical role in the franchise’s success. Known as the Breezer or VBK, the Detroit born goaltender played for the Panthers from 1993 till 1998. In addition to setting numerous franchise records, Vanbiesbrouck played an instrumental role in the Panther’s trip to the Stanley Cup Finals in 1996. A few other players who deserve a mention in this category are Roberto Luongo, Scott Mellanby, Stephen Weiss and Robert Svehla. The BB&T Center overlooks the glorious Everglades where the endangered Florida Panther still roams. Its ideal location adjacent to Fort Lauderdale and just north of Miami allows fans of all ages to take in some great pre-game activities. The arena also provides fans with a unique nightclub experience with Club Red. It will be interesting to see how the changes in the Panthers front office and line up reflect on the ice rink. There is a possibility that the Panthers make it all the way to the playoffs this season. Be there when it happens with Florida Panthers Playoff Tickets available here. Our process for purchasing cheap Florida Panthers tickets is simple and fast. There are so many online ticketing sites, that it can be hard for customers to find the right place to buy Florida Panthers tickets at the cheapest price. At ScoreBig we think of our customers first and foremost. We offer daily deals for Florida Panthers events, so our customers can get the best seats for the best prices. ScoreBig will always go above and beyond to offer the cheapest Florida Panthers tickets on the market. The Florida Panthers schedule above, displays all available events for 2019 and 2020. Once you find the event that you would like to go to, click the red “Get Tickets” button. It is located on the right-hand side of the event listing, it will take you to an Florida Panthers event ticket page. ScoreBig's event ticket page will display all available Florida Panthers tickets for that event. On the event ticket page to help with your search for the right Florida Panthers tickets, use the filters at the top to select quantity, price range, and more. There is also an interactive seating chart so you can pick where you want to sit. When you are ready to buy a ticket, click on the listing, and you will be directed to ScoreBig's checkout page. Upon completion of the information fields, your order will be processed and your Florida Panthers tickets will be delivered via email, mail, or to your mobile device. What makes ScoreBig’s site stand out from the rest? We are constantly analyzing our competitors to improve our site, service, and prices. ScoreBig.com employees strive to offer the best process and experience to buy cheap Florida Panthers tickets. Our goal is to get you the best seats to Florida Panthers events. We offer daily discounts on our site and for special promotions check out our newsletter. If there are no Florida Panthers events currently available, you can use our search feature at the top of the page to see a list of all popular events going on near you. No matter your price point, we have all the best deals and discounts on Florida Panthers tickets. For more information on prices of Florida Panthers tickets and the schedule for Florida Panthers, check out our listings above. The last thing you want to find out is when the Florida Panthers event you wanted to go to is sold-out. Don’t worry in many cases ScoreBig has affordable tickets to sold out events. We sell tickets from GA all the way to premium seating and parking. Skip the scalpers in the parking lot and get your tickets online from top Florida Panthers ticket brokers. We get you in all events, buy your Florida Panthers tickets here from a brand that many trust and rely on for all their ticketing needs. ScoreBig offers a 100% money-back guarantee. If you have been in search of cheap tickets for Florida Panthers, ScoreBig by far is the best option. That’s why ScoreBig has more loyal customers than any other ticketing site. 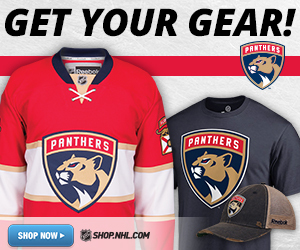 Shop at ScoreBig for safe and secure Florida Panthers event tickets.